A few years ago, I dressed as rejection for Halloween. 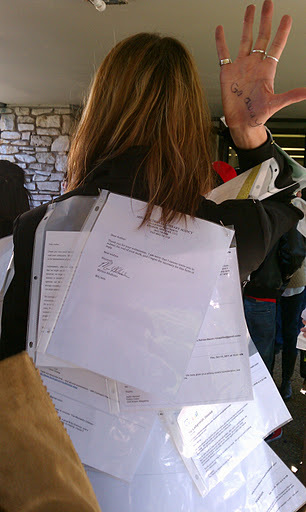 I pinned all of my rejection letters to my jacket and a red, paper, broken heart to my jacket’s lapel. I wrote “No!” and “Go away!” on the palms of my hands. I took my son’s toy collapsable knife and pretended every so often to plunge it into my chest. “What are you?” a few people asked. But now I have a publisher and my novel will be published soon. Wow. October 12th! That’s scary too. But the book will be out there. The novel I spent hours (years) working and reworking, the characters I spent so much time with and tried to understand, they will leave me and go out into the world. I remember one afternoon years ago when I was walking across a parking lot and had just finished a scene I was especially happy with. The characters and their actions that I had finally figured out were spinning about in my head. I was so happy with them! I laughed. “Yes, it is!” I called after her. And now the novel is done. Really done. And I am happy about that. Marta, a thousand times over, I wish you all the success in the world. Your book is compelling ~ a strangely haunting story, and I hope it will do well for you. And thank you a thousand times over, Niamh. Thank you. Thank you for your continued reading and your support. It makes a difference. There’s a song I often hear at folk dancing in which the singer looks back to his childhood, which he describes as paradise. That song always depressed me until I changed two of the words to make it mean the opposite. I always sing my version (no one can hear me above the noise) and feel better about it. So I can believe making fun of rejection can be good for you. Good luck with the book! Hurray for singing your own version. I’m all for that. And thanks, Miriam.